Houston is a big city. I mean, a really, REALLY BIG city. It takes at least an hour to drive from one side to the other – without traffic. And there is ALWAYS traffic in Houston. Yep. Flew out of Hobby and landed at George Bush Intercontinental where I caught my connecting flight home. But that’s okay. Texans like big things. 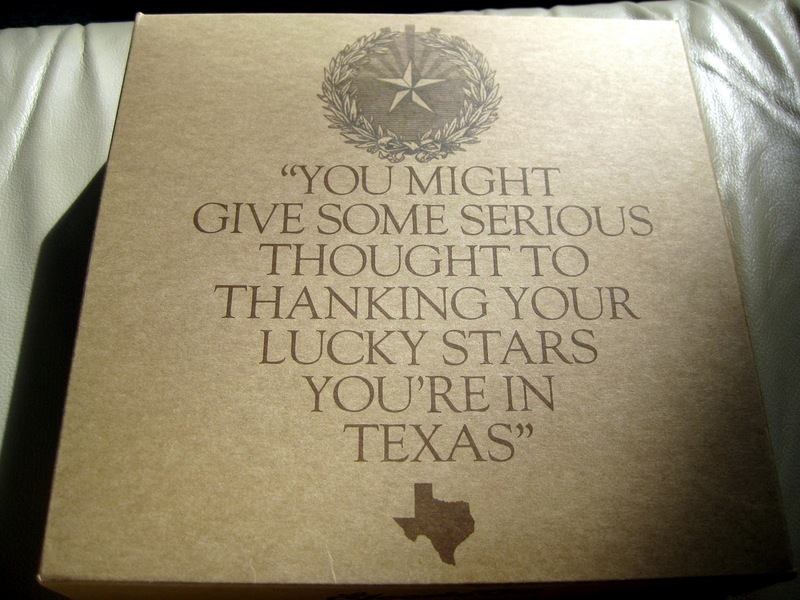 And no matter how fast-paced and cosmopolitan of a city you find yourself within the borders of the Lone Star state, Texans always make sure to let you know you’re still in Texas. 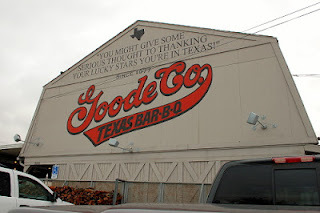 That fact always comes to mind whenever I find myself at Goode Company Barbeque. Authentic barbeque comes from smoky shacks on the sides of lonely bluebonnet emblazoned farm-to-highway two lane roads. Nestled in the Hill Country. Or in the center of barbeque crazed small towns like Driftwood, Elgin, Luling and Lockhart. 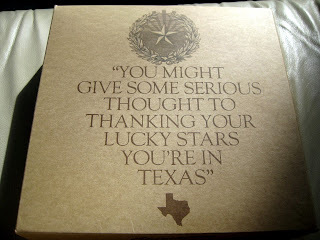 But part of what makes Texas such a great nation is that you can find it here too. Smack dab in the urban hell of sprawling Houston. This is Big City Barbeque. If sitting in the horrendous traffic on Kirby Drive makes you forget you are in Texas, you’re reminded as soon as you park your car. You can also get that timeless bit of wisdom emblazoned on Goode’s T-shirts, coffee mugs and to go boxes of whole pecan pies. The set-up is classic Texas. The smell of meat slowly smoldering over mesquite. 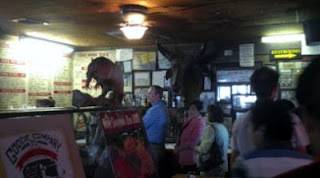 Guns, beer signs and other rustic décor inside. Beers iced down in an old fashioned tub. 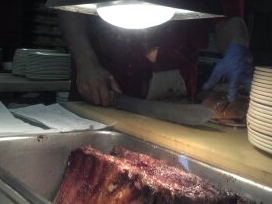 And a long line of hungry customers slowly making their way toward the scary looking dudes with the meat and knives. If you didn’t know any better, you’d swear you were in La Grange. That is, except for all the dresses, suit skirts, ties and Cole Haan dress shoes in line with you. A trio of indecisive suit-wearing high-rise office dwellers on their lunch break in line behind me tapped me on the shoulder and asked me if the jalapeño sausage was too spicy. You know you’re in the big city when the locals turn to Suit757 – dressed in a suit – to ask for advice on what’s good here. In reality, I’m always the best person to ask – I mean, that’s why I write this blog. I’m been everywhere, tried it all and lived to tell about it. But I don’t get asked for advice by locals anywhere else I go. More like stared at suspiciously. The perpetual out-of-place out-of-towner. The object of the collective head swivel. The guy at Cheers whose name nobody knows. The suit at the pool party. But here in the Big City, dressed in a suit, like everyone else, I actually -- dare I say -- fit in! I look like a local barbeque connoisseur. Suit757, we’re not in Lockhart anymore. “Great. Thanks,” my fellow suit-wearer said. “Well, you’ll love it”, I politely said instead, as I thrust my hand into the ice chest to retrieve my drink. Frosty Shiner Bocks, Lone Stars and Coors Lights all looked tantalizing laying there snugly in their icy beds. But alas, Suit757 was working today, like everyone else in line. So I opted for what I thought was a good compromise – a St. Arnold’s beer. 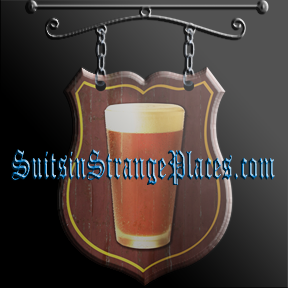 Houston-based St. Arnold’s is my favorite microbrewery in all of Texas. Unlike most Texas brewers, St. Arnold’s isn’t afraid to make brews with real taste. While a St. Arnold Root Beer can’t compare to an Elissa IPA, I liked the idea I was supporting the folks who do such a good job putting a smile on my face once my Suit757 workday is done. 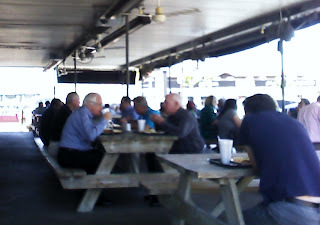 By the time I toted my tray of Texas barbeque to a vacant end of one of Goode’s picnic tables, I only had ten minutes to enjoy my lunch before I had to snap back to reality and negotiate Houston traffic for my 2pm meeting. But it was the best ten minutes of my day. When in Texas, you get brisket. 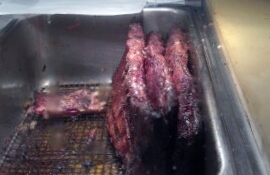 Goode’s brisket was thin sliced and fall-apart tender. Like beef transfigured into butter. Delicious under a thin coating of Goode’s famous sweet tomato-based sauce. 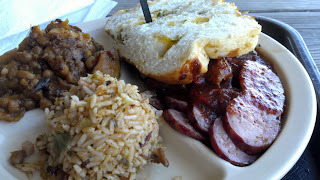 That sauce also covered the jalapeño sausage which was sliced diagonally into big bite sized ovals of smoked meat. It tasted great, but I was disappointed in the lack of spice. Either the cleaver guy gave me the wrong kind of sausage or my link just didn’t have much jalapeño. Believe it or not, the spiciest item on my plate was the bread – jalapeño cheese bread impaled into the meat with a plastic spike. Soft Texas toast infused with bits of cheese and peppers, my jalapeño cheese bread was perfect for lapping up that extra sauce and grease. But man can not live on bread and meat alone. You can’t come to Goode’s without getting some of their famous over-the-top sides. 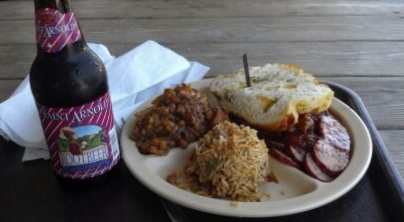 Houston shares a lot in common gastronomically with its neighbor to the east, Louisiana. It’s not hard to find Cajun specialties like gumbo and jambalaya here in “The Bayou City”. Goode’s Texas version of jambalaya is mostly rice with some peppers, onions and smoky ham mixed in. Trust me, you won’t find that on the menu in Lockhart. 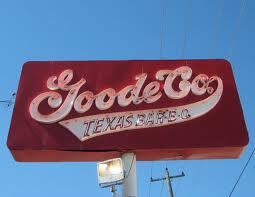 You won’t find anything resembling Goode’s baked beans either. These beans have no relation to any other you’ve ever tried. In fact, the beans are a mere afterthought compared to the peppers, onion, bacon and stewed apples that make up this incredible recipe. The spice of the peppers, the savory smokiness of the bacon and the sweetness of the apples create a Mardi Gras of flavor in every bite. Absolutely delicious! Like all traditional Lone Star State BBQ joints, dining at Goode’s is on long communal picnic tables outside in the Texas heat. You sit shoulder to shoulder with your fellow diners and make small talk about how good the food is. When I finally sat down to eat at 1:41pm I thought about how I didn’t have much time for conversation today. At 1:45 a couple blue collar black guys joined me across the picnic table. Fearing that my frantic chewing and gastrological grunts might be taken for rudeness, I explained that I had a 2pm meeting I had to get to. “I don’t think you’re going to make it,” the older gentleman said. “Well, being late isn’t an option. 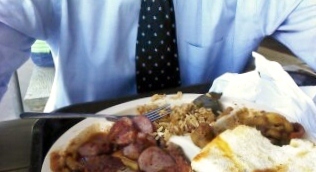 But leaving any of this great food behind isn’t an option either,” I said as I further accelerated my food shoveling. I think they were impressed with the eating capacity of this white boy in a suit as we made conversion about baseball and the hapless Astros between chews and swallows. Sure enough, at 1:50 on the button, I stuffed the last bite of sausage in my mouth, garbled my fellow BBQ eaters a good day and headed off to the rental car in the parking lot to race back into Houston traffic. Some day I’ll be able to leisurely mingle under the Texas live oaks out in some wildflower-lined Lone Star countryside, food slowly digesting -- and even go back for seconds of that legendary pecan pie. But not now. Not in Houston. Not with my Suit757 schedule. 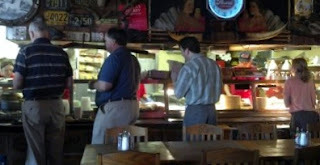 As long as I’m still working to pay “the man”, Big City Barbeque will have to do.